Coffee planters in the major growing regions of South India are in in distress as the price of the Robusta variety has been falling in the past two weeks. Especially hit were some who were holding on to their stocks in anticipation of bumper prices. The farmgate price of Robusta cherry are now Rs 3,300 a 50-kg bag from Rs 4,000 a bag in March. “The prices have fallen in India mainly due to the decline in global prices. The news of Brazil not going to see a drop in production and a bumper Robusta crop in Vietnam this year has influenced prices globally. 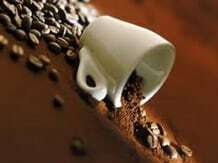 The price of Robusta has come down by about $350 a tonne in recent days, after a high of $2,200 a tonne,” said Damodar Kamath, an exporter from Mangalore. The price is currently $1,885 a tonne, less by 14.3 per cent compared to $2,200 a tonne in February and March this year. “ICE Arabica coffee futures on Monday sank to their lowest since late February, as speculators exited due to lingering uncertainty over potential drought damage in top producer Brazil and sell-stops deepened losses,” said the Coffee Board. According to the International Coffee Organisation, certified stocks of Robusta on the London futures market have jumped significantly, more than tripling from 274,000 to 855,000 bags (each bag here is 60 kg) at the end of April. Vietnam, a major producer of Robusta, is said to be harvesting a record crop of 29.3 million bags for 2014-15, about 1.7 mn bags more than the previous year. In Brazil, set to reap a higher crop, the average yield for Robusta production is expected to increase from 24.1 bags a hectare in 2013-14 to 27.5 bags in 2014-15. 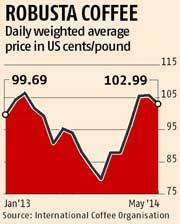 “Added to this, the rupee’s appreciation against the dollar in recent days has also dampened the spirits of exporters. However, we do not expect any major impact on exporters from the price fall because most of the coffee stock is normally sold before the onset of monsoon,” said Kamath. Some growers who were holding on to their stocks are worried as the cost of production has gone up and the current prices are not remunerative. The white stem borer is adding to the problem. “In addition to price fall, we are worried about its spread this year. It is likely to damage the crop for the coming year,” said Marvin Rodrigues, managing partner of the James Rodrigues Group of Plantations in Coorg.